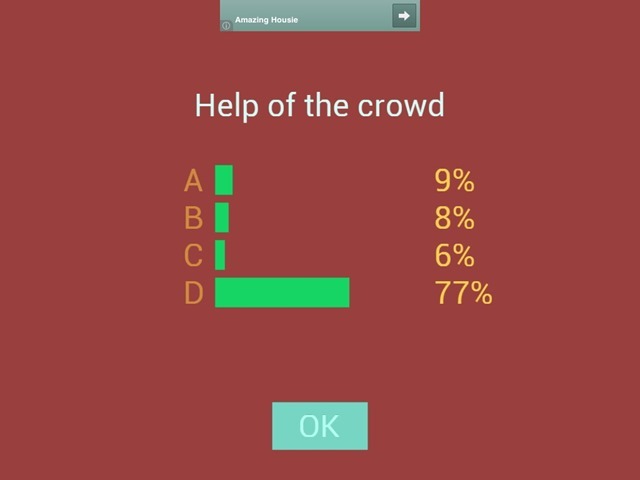 This week’s pick is Ultimate Trivia: The Quiz by iRaf Studio. 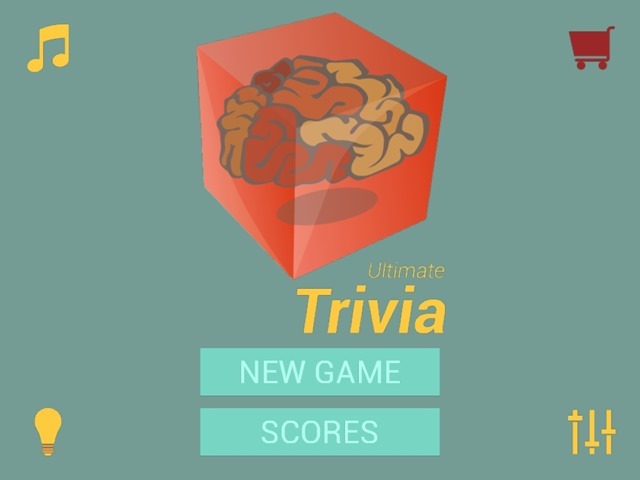 This is a simple and quick trivia game that is also a whole lot of fun. It’s inspired by the ‘Who Wants to Be a Millionaire’ TV show, but done much more simply than many similar games that have lots of graphics, animations, and bells and whistles. As in the TV show, you’ve got 15 multiple choice questions to get through to win the top prize of $1 million in game currency. The questions cover a good range of topics – including History, Science, Geography, Politics, Sports, Literature, and plenty more. As you can see in the screenshots included in this post, there’s a very plain look to all the game’s pages – and that’s fine by me for this type of game. Again as in the TV show, you have 3 Help items you can use in each try at the game: ‘Increase the Chances’ gets rid of 2 wrong answers and leaves you with 50/50 odds; ‘Help of a Virtual Friend’ has the game’s virtual friend giving you their best shot at the correct answer; and ‘Help of the Crowd’ shows you in percentage terms what the crowd thinks. Just as in real life, the results when you get help from a virtual friend or the crowd are very inconsistent. In fact, I’ve found the friend has quite a poor track record. The game has more than 15,000 questions in its question set and its App Store page promises more in every update. I’ve seen a few repeat questions while playing the game a heck of a lot, but not enough to detract from the enjoyment. You can share your results via Facebook, Twitter, email an Message – and keep tabs on scoring leaders via Game Center. The game is ad-supported but they’re small and don’t get in the way of gameplay at all. I honestly barley notice them. 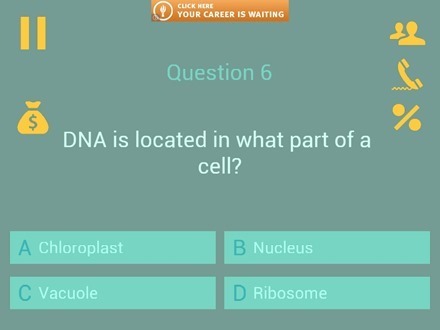 I’m always a sucker for a good trivia game, and this one fits the bill. Ultimate Trivia: The Quiz is basic, fast and fun to play, and very addictive. I find myself playing it many times over on a daily basis as it’s perfect as a quick pickup and play in between things. Here’s an App Store link for Ultimate Trivia: The Quiz: it’s a universal app designed for both iPad and iPhone.